Ivan Kupala Day is one of Russia’s most colourful festivals and traces its origins back to the country’s pagan past. Last month, when an anxious India waited with frustration for the monsoon rains to sweep the country, Russians, particularly Muscovites, would have gladly traded the rain and cold weather they experienced for some Indian sun. The sun is seen as a blessing in most parts of what we Indians consider the far north. Winters can be painfully long and dark. It may be an initial novelty to go to the office in the dark (even at 9 am) and come back home in the dark, but the prolonged darkness and the lack of sun tends to lead to depression over the long run. Rains have the exact opposite effect on people in India and Russia. A cloudy day with even a slight drizzle is enough to turn the most cheerful residents of St Petersburg a bit grumpy, as I witnessed recently. This is in great contrast to the revellers on Mumbai’s Marine Drive who eagerly await the monsoon showers on the city’s favourite public place. The Russian capital can change from a morose and gloomy Eastern European city to a glorious and beautiful place when the sun comes out. In the last week of June, there is visible daylight right through midnight. 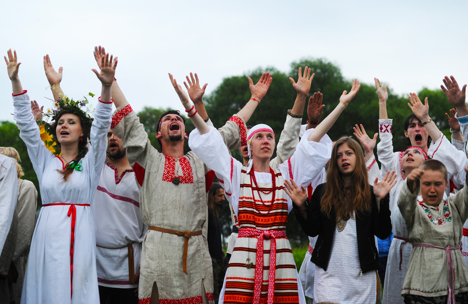 The days in Russia start getting shorter after the summer solstice but there is one pagan-origin festival that is celebrated on July 7 with different degrees of enthusiasm in different parts of the country: Ivan Kupala Day (John the Baptist Day). The holiday was initially connected with the summer solstice, but when Russia adopted Christianity, the festival was rededicated to John the Baptist and proclaimed his birthday. Having many friends who relish Russia’s pre-Christian rituals and cling on to old superstitions, I was a part of many celebrations of this festival. My most memorable Ivan Kupala Day was celebrated in 2005 in the countryside by the Amur River in the Khabarovsk territory. It is an ancient belief that on the night of the festival, water is blessed and has special powers to heal many ailments. Our celebration by the river, which originates in China, was held before the Jilin Chemical Plant explosions sent toxins into the Amur and kept most people permanently out of the water. According to legends, bodies of water remain pure and therapeutic right up to early August when Ilya’s Day (in honour or Prophet Elijah) is celebrated. The festival also has rituals involving fires and there are several dances performed around campfires. These dances are intended to scare off the evil spirits that roam around during the shortest night of the year. There is also a wonderful ritual where couples are supposed to jump hand-in-hand over the fires. If their hands stayed clasped after the jump, it is an indication that they would be together forever. Unfortunately the complexity of relationships changed from Russia’s pagan days, and all but one of the couples who were destined to be together for eternity in 2005 after their successful jumps, broke up over a period of time. Another beautiful ritual of the festival is to put wreaths with a candle on the river and let them flow away. This reminded me a lot of the way women lit diyas and placed them on the Ganga. Of course in Hardwar and Varanasi, the diyas are lit by women to bring happiness to their husbands and families. As per the Ivan Kupala tradition, the girl whose candle burns the longest will live the longest life and whose wreath floats the longest, will be the happiest. I am not sure how this will turn out, but thankfully all the girls are alive and they are happy with their lives. Ivan Kupala Night is also the night that spells are supposed to be the most powerful and long lasting. Along with many new age practises, there has been a revived interest in the Wicca movement around the world. Some believe that black magic used for a good cause can be very effective on this night. The relatively short summer in Russia is a wonderful time to appreciate the country’s vast and great outdoors. People bask in the sun and enjoy certain delights (like wearing light clothes) that we in India take for granted for the most part. This is a wonderful season to travel across the country and see it at its greenest best. In some parts of the country, July and August can be uncomfortably hot. For those afraid of being in a place where it gets extremely hot, without the luxury of fans and air conditioners, a summer storm and rainfall is never too far away in Russia. Temperatures can plummet on rainy days and even fall below 20 degrees. The old joke is that a cold winter day in Mumbai is very much like a typically hot summer day in Moscow.